Winter has finally released her grip and spring abounds at Rustic Studio. If you can envision Snow White’s bucolic glade teaming with colorful birds and squirrels and deer, then you’ll have a good idea of the world surrounding Rustic Studio. And if Bambi is one of your favorite fairytales then you will love the story of Sunshine. This is a picture of Sunshine grazing outside the studio. We suspect she was born last spring. She showed up this winter, alone and badly injured. It appears that Sunshine was hit by a motor vehicle. Her right front leg is broken and swings uselessly from her shoulder. Her back lower leg is also damaged, yet appears to adequately support her. Somehow Sunshine found her way to our little glade and has made it her home. For several weeks now she’s been feeding herself from our bird feeders and drinking from our small back pond just outside the thicket where she beds down at night. Each day she hobbles across the grounds cleaning out the feeders and eating the greens we put out. 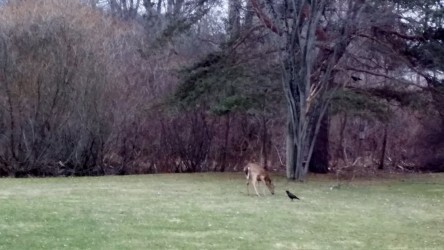 She grazes alongside rabbits and squirrels, cardinals and robins, and sometimes other deer as they dine on a healthy mix of millet and sunflower seeds. Some evenings Sunshine lies under our silver maple tree and watches me through the French doors as I prepare supper. Last week two crows tried to chase Sunshine away from the feeders, but she didn’t budge. It was a proud mama moment for me to see her well enough to stand her ground. I’m not fond of the crows or the hawks that occasionally camp out in our trees because they are aggressive, but I can’t begrudge them claiming their little piece of the pie. They know a good campsite when they see one. Several red-headed downy woodpeckers and bluejays have commandeered the suet feeder leaving only ground scraps for the chipmunks, but they all seem to be getting their fill. Our resident groundhogs Woody, Charlie, and Mrs. Fatbottom and their ever-growing family are out of their burrows now, so I’m willing to believe that winter is finally over. To my delight, two mallard ducks have made their home in the small marsh out back. Each day the “Mallards”, as I refer to the pretty couple, paddle slowly among the reeds and sumac bushes. At feeding time they waddle up through the grass fluttering their tails and scouting for the best treats. I expect to see a clutch of little ones trailing behind them soon. Sunshine and I have spent many days together, she grazing, me writing and daydreaming. My Rustic Studio is such a beautiful place to live and write. 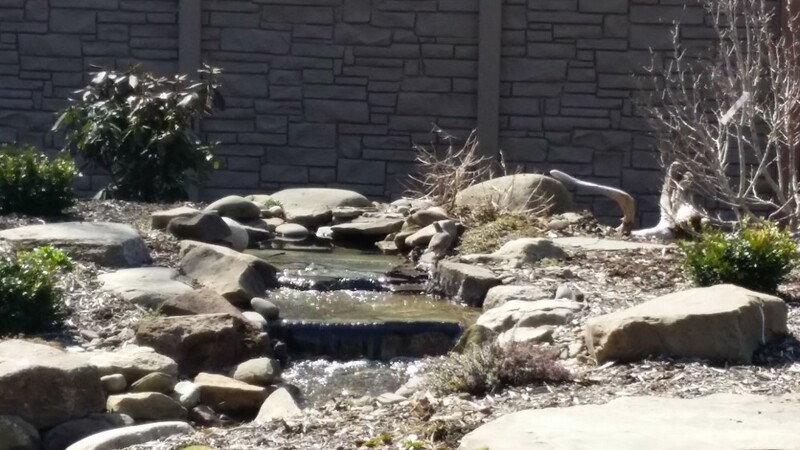 As I listen to the babbling waterfalls of my water feature, I imagine the world the Graysons live in. I think about Nancy Grayson as she goes about her daily chores of hanging laundry on the line while her grandchildren play in the apple orchard. In their faces she sees the faces of her own boys when they were young—and she remembers a man she has loved all her life…and a new man who is teaching her how to love again. How did this sassy, vibrant woman command the love of two great men? How did it all begin? I planned to write the story of Nancy falling in love for a second time in her life—with Dawson Crane—but to tell their story I need to tell you about her first love with Hal Grayson. So…how do you think Hal and Nancy’s romance began?